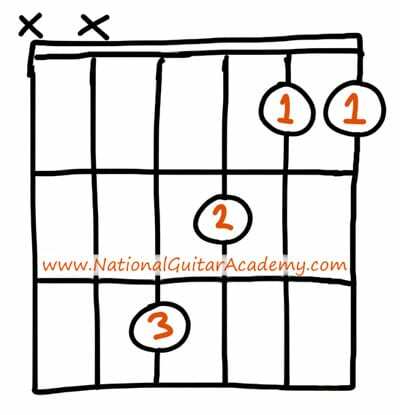 Let’s look at the correct way to play an F guitar chord first, then we’ll look at the easier alternatives. Sound like a plan? Let’s do it. 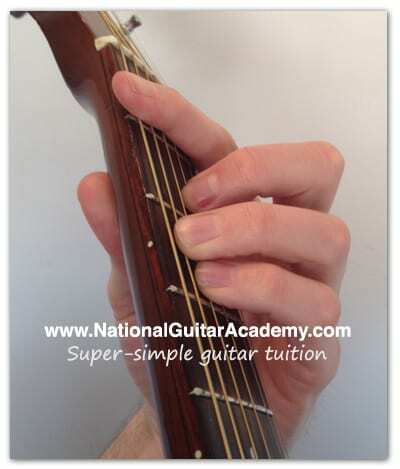 As you can see this is a difficult chord – it’s simply not possible for a beginner guitarist to play an F guitar chord (in this way). Clearly we need to find easier alternatives, so let’s get to it! As you can see, we no longer need to totally barre the first fret, so that’s a huge relief for a beginner guitarist. Even so, this chord still requires solid concentration and a good level of dexterity to play. 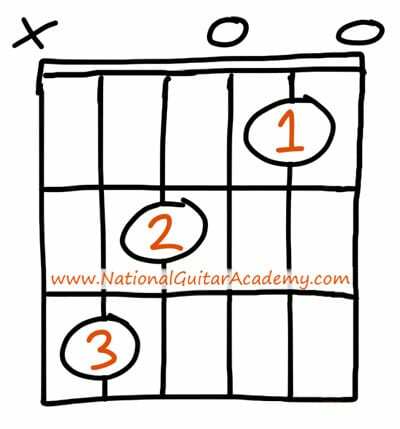 If you’ve been playing the guitar for only a few hours this will still be a very difficult chord for you to assemble quickly and consistently. We need an even easier alternative. Ok, now we’re getting to a lower barrier of entry. This chord is called “Fmaj7” (pronounced “F major seven”). As you can see, this is significantly easier than the first version of F that we looked at. In a moment we’ll look at the easiest-of-all ways to play an F guitar chord, but firstly there’s an important point I need to flag to you. 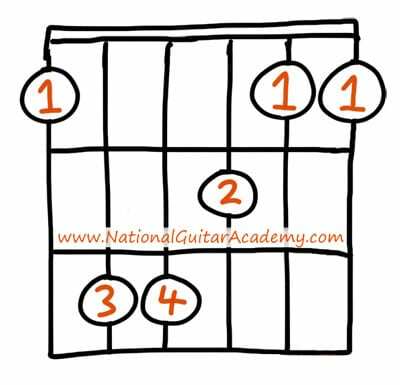 Note that when playing both the above versions of an F guitar chord you should only play strings 1-4. Your strumming/picking should begin on the 4th string. 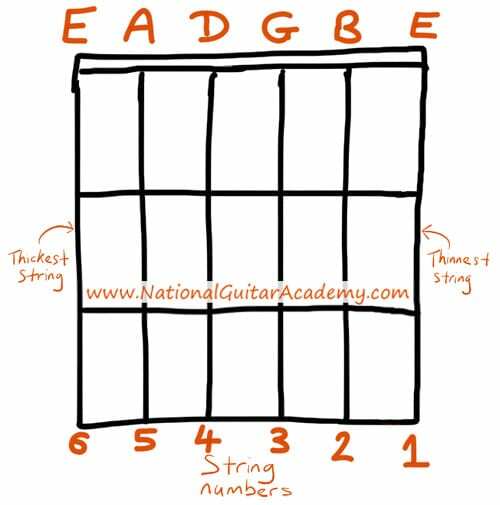 If you play the fifth string (the A string) when playing either of the above F guitar chords it won’t kill the chord (it’ll still sound ok, just) but if you accidentally play the 6th string (the E string) it will wreck the chord. This version of F doesn’t sound as good as the earlier versions, but it’s passable, and it will act as a stepping stone towards the better-sounding F chords. 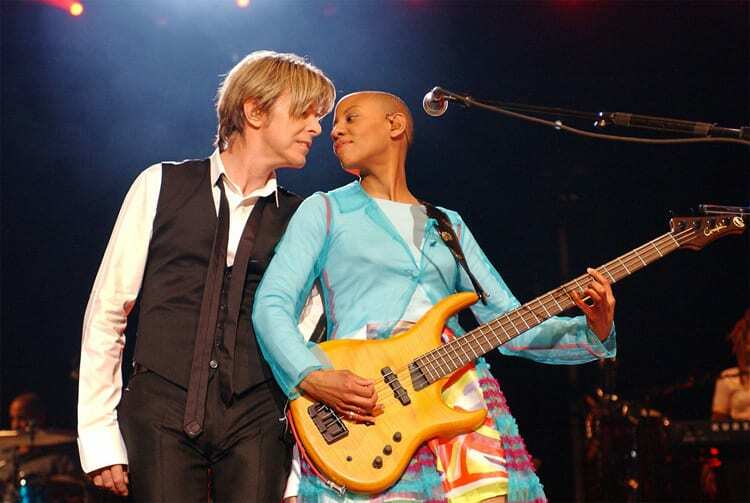 Remember: F is a tough chord, so don’t worry if you’re struggling with it. Learning guitar takes time! 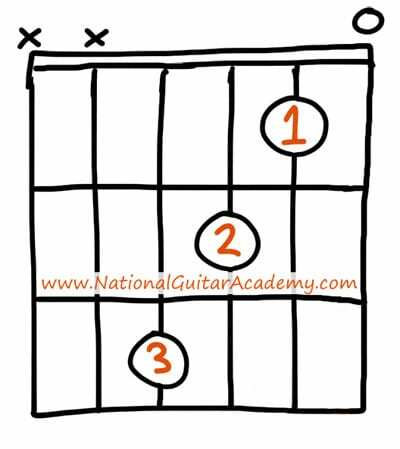 The F guitar chord is one of the very toughest chords for a beginner guitarist to play, so don’t worry if you find it challenging. That’s perfectly normal. With this in mind, I tell my new students to skip all songs that feature an F chord until they’ve been playing guitar for at least a month. 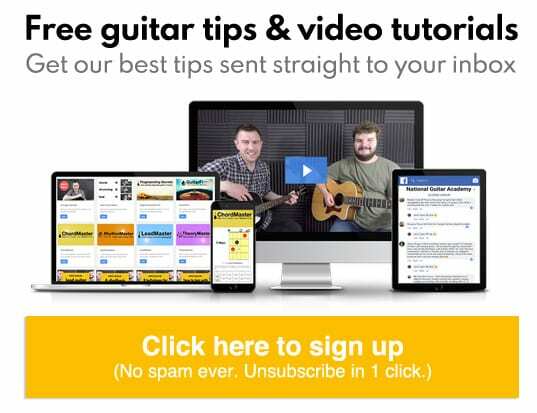 After 4-6 weeks most people have mastered simpler chords like Em, G, Am, D and C. By that stage they have developed enough control and precision in their third finger that they can perform the above easier F chords without it being too tough. For the vast majority of adult learners, Fmaj7 should be the first goal. It sounds great and is much easier to play than a full F chord. Note how closely a Fmaj7 chord resembles the shape of a C chord? 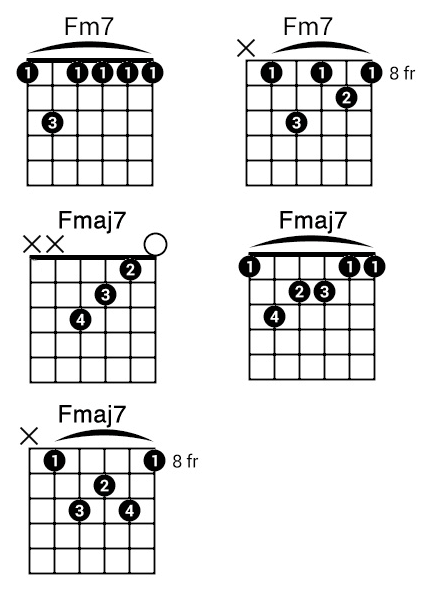 This is one of the things that makes Fmaj7 a handy chord to know, because F and C are common bedfellows, they crop up together often, along with G.
More F chords (6ths, augmented, diminished etc).